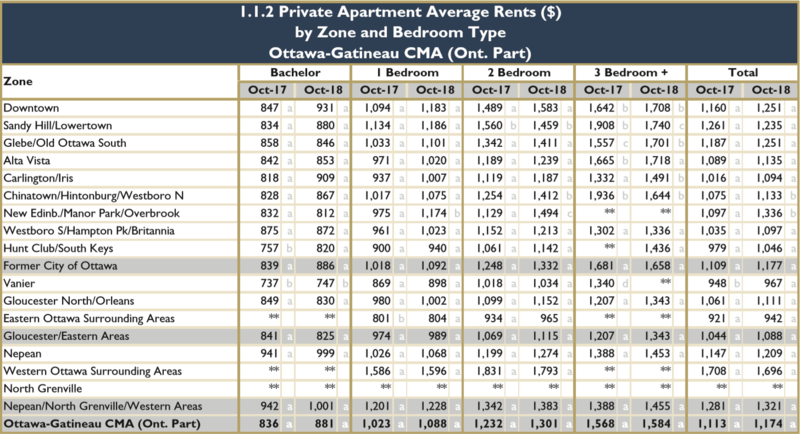 The latest rental market reports for Ottawa-Gatineau were released in November and if you haven’t had a chance to look at them yet there’s some interesting tidbits in there. 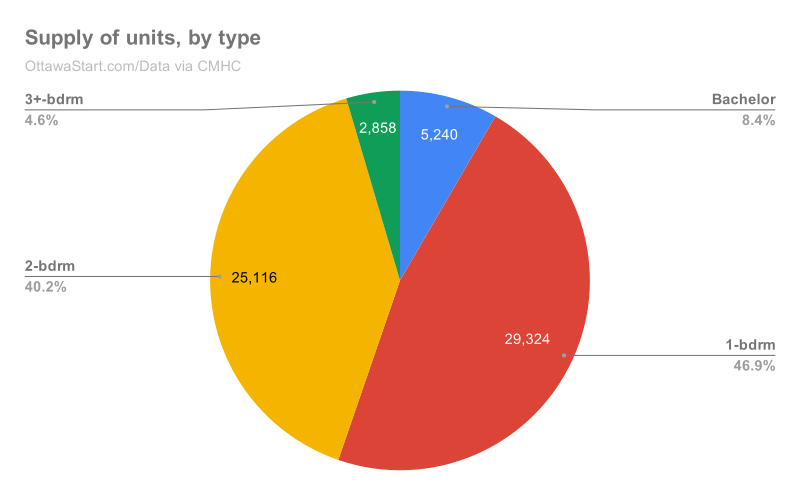 The Canada Mortgage and Housing Corporation, a crown corporation that reports on the housing sector, releases a report every year for both cities with details such as vacancy rates, average rents and a whole lot more. It’s a good snapshot of the market – I’m just going to present data for Ottawa, but you can find links to both reports further down. “Strong demographic and employment conditions supported rental demand [in Ottawa] in October 2018, pushing up average rents for fixed-sample structures for all bedroom counts,” says Anne-Marie Shaker, senior analyst, economics, CMHC. 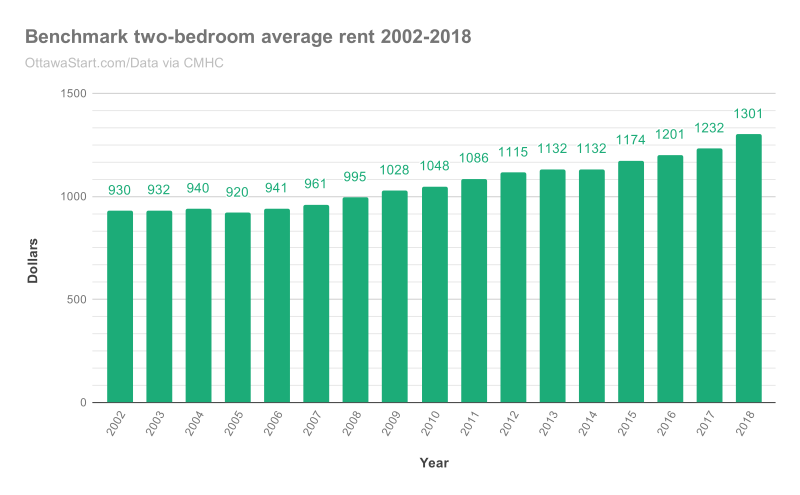 The city-wide average rent in the latest report, which is a new metric CMHC has started providing in the past few years (they used to only provide the average for two-bedroom apartments as a benchmark), was $1,174, up by 5.6 per cent from $1,113 in 2017. The purpose-built rental supply increased by 527 units, which was enough to cancel out the increase in demand, but not enough to increase the vacancy rate. CMHC has lots of tables in their reports with numbers on all kinds of aspects for the rental market, here’s two that give you an idea of apartment prices, by location and building age. CMHC has lots of other information on their website. 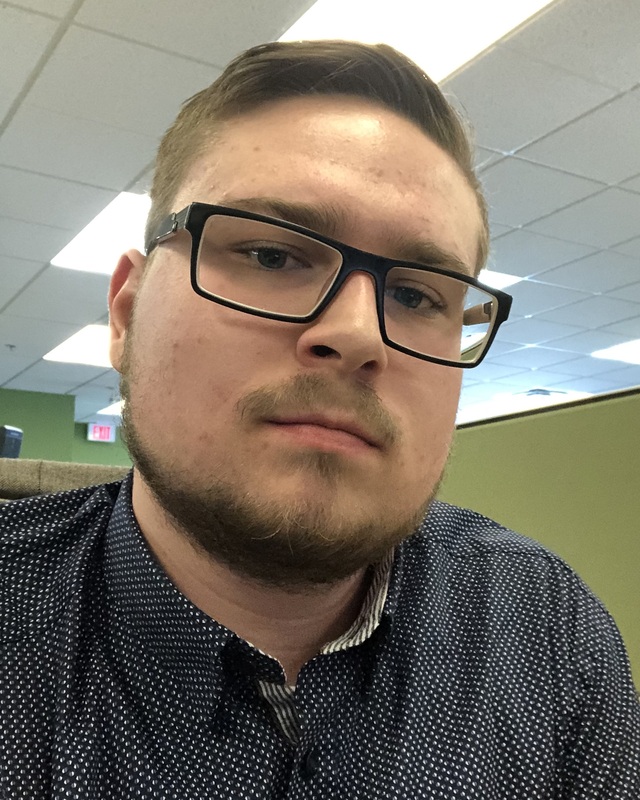 Randall Denley has been writing a good series of columns in the Ottawa Citizen about affordable housing: A Roof Over Our Heads. You may also be interested in this story about affordable rental housing in the west end that I wrote for StittsvilleCentral.ca. Here’s a report from the Association of Community Organizations for Reform Now about the state of affordable housing in Ottawa. If you, or someone you know, are looking for an apartment in Ottawa, check out our apartments guide for useful links and resources.